In the 1920s researchers became interested in the sociology of exactly how rapidly advancing technologies were dispersed and then adopted by farmers. By the 1960s a theory known as diffusion of innovation detailed the process of how, why, and at what rate any new technology is spread to a community. 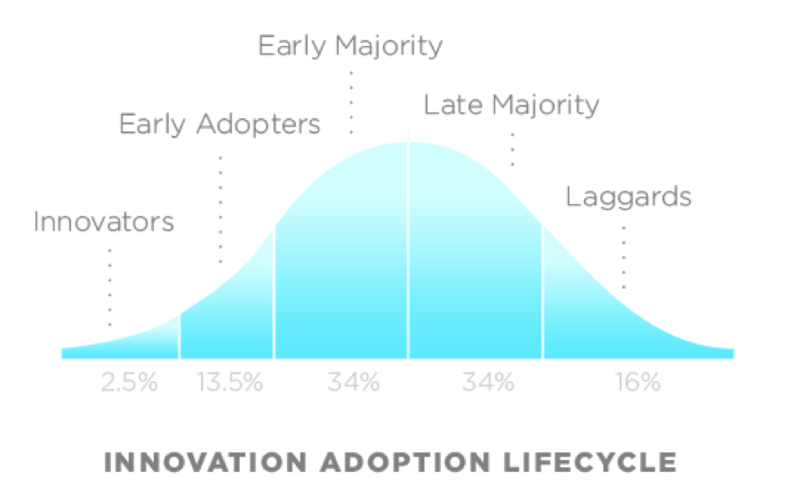 A key group in a community are known as Early Adopters. These folks, representing an estimated 13.5% of the population, are the first to embrace new advances and allow a technology to gain an early foothold. Early Adopters may also enjoy a competitive advantage in the marketplace. In this article, on an animated map you can see how a novel contaminant delineation technology has spread across Canada since 2011. Were you one of the Early Adopters back in 2011? Vertex started with High Resolution Site Characterization (HRSC) during a pilot-scale trial back in 2011. The technology is now used country-wide and has even been adopted into the CCME Guidelines for delineationpractices. The Diffusion of High Resolution Technology in Canada. The Toronto waterfront was the site of our first use of HRSC technology in Canada back in April of 2011. Early Adopter clients understood that real-time field readings could eliminate multiple mobilizations with a drilling crew. The iterative process of a delineation program suddenly had, well, fewer iterations. 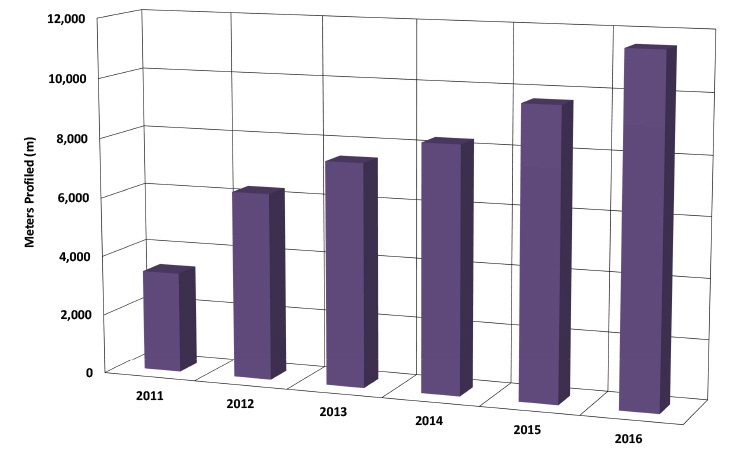 The number of clients and number of annual meters profiled has increased each year since 2011, with over 11 km profiled during 2016 alone! It is interesting that innovation adoption lifecycle still holds true after 50 years – even with incredible advances in new technology that couldn’t even have been predicted back then! Can HRSC Replace Laboratory Analysis? Yes and No. A major advantage is the collection of on-the-fly information. Massive amounts of HRSC data is collected, quickly and cost-effectively. When combined with traditional Phase II Environmental Site Assessment (ESA) methods, they greatly enhance the understanding of presence, concentration and distribution of contamination in the subsurface. The rapidly collected data in turn reduce the number of field mobilizations for drilling and sampling and the number of samples required for laboratory analysis. Laboratory analysis is required to validate field contaminant concentrations detected by the HRSC instrumentation. In some cases it is even possible to produce a correlation between HRSC readings and laboratory analytical data, greatly simplifying the approach to accurate delineation of contamination in the field. Is this Technology Accepted Practice in Canada? Often this question is phrased along the lines of “where have you used this?” The real meaning of the question: “is this an accepted technology”? HRSC technology was first developed in the United States and was actively deployed in the U.S for at least a decade before we brought it to Canada full time. However, common practice in the U.S. does not necessarily translate into accepted practice in Canada. And certainly not right away. By the end of our first year in 2011, we had successfully deployed the HRSC tools at fifteen sites. As we approach the end of 2017, we have now used the technology at over 170 sites! Many of these are situated in Southern Ontario and Quebec. But our clients have also applied the technology extensively at sites from Goose Bay, Labrador to Cold Lake, Alberta to northern British Columbia, to Whitehorse, Yukon. Site types vary from corner gas stations, industrial manufacturing facilities, upstream oil and gas facilities, highway maintenance yards to Canadian Forces Bases. Along with this variety of sites the geologies that Vertex has had to profile have varied widely across Canada. Everything from tight silt tills to glacial sand and gravel deposits. Each geology presents its own unique challenges and Vertex has been able to tackle them all learning more and more, and expanding HRSC capabilities along the way. Being able to capture these data sets for clients across Canada has been quite a journey and we can’t wait to see where it leads us in the future! The cost of this type of investigation is quite affordable when comparing the amount of data collected with the HRSC instruments vs the data collected with traditional investigation techniques (drilling and sampling). We have mobilized and completed cost-effective HRSC programs on both the east and west coasts and in the arctic of Canada. The HRSC technology is very affordable when your site investigation or delineation program would otherwise require multiple mobilizations and iterations of testing or when a high level of detail is required to understand subsurface site conditions. For detailed costing and estimating please feel free to contact us and we will be happy to help out and design a HRSC program that fits your site needs and budget. The world of HRSC is constantly moving forward with new technology and tooling being invented and tested. 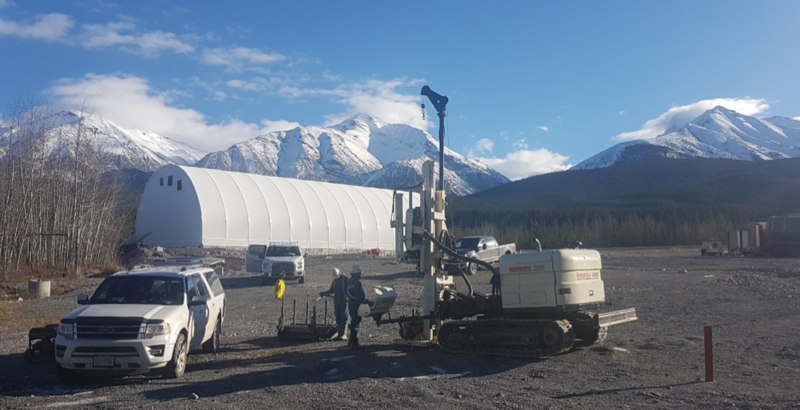 Recently, Vertex deployed a dual Laser Induced Fluorescence (LIF) probe to complete an interesting site investigation, the first of its kind in Canada. The dual LIF probe housing both a TarGOST and UVOST unit was deployed in Ontario to further investigate a large development site in Toronto. This dual LIF probe was able to simultaneously detect petroleum hydrocarbon Light Non-Aqueous Phase Liquid (LNAPL) and Dense Non-Aqueous Phase Liquid (DNAPL) products! The data was then used to refine in-situ pilot-scale remediation activities in order to better account for subsurface contamination conditions at the site. Stay tuned to see what comes next in the world of HRSC! Kevin French, B.A.Sc., P.Eng., has 25 years of experience in environmental assessment and remediation. Kevin holds a Bachelor’s Degree from the University of Waterloo where he studied Civil and Environmental Engineering. Since that time, Kevin has been involved in the design and implementation of remediation programs relating to chlorinated solvents (including DNAPL), petroleum hydrocarbons (including LNAPL), PAHs/coal tar, heavy metals, etc., at hundreds of sites across Canada. This article was first published in Vertex Environmental Inc. Newsletter. Who is Charge of Harbour Clean-ups in Ontario?